One of the most common questions I get when booking my sessions is “What should we wear?” Since everyone has their own individual styles and personal preferences, this can sometimes be a challenge to explain without any visual aids. In order to help, I’ve decided to put together some visual wardrobe inspiration. 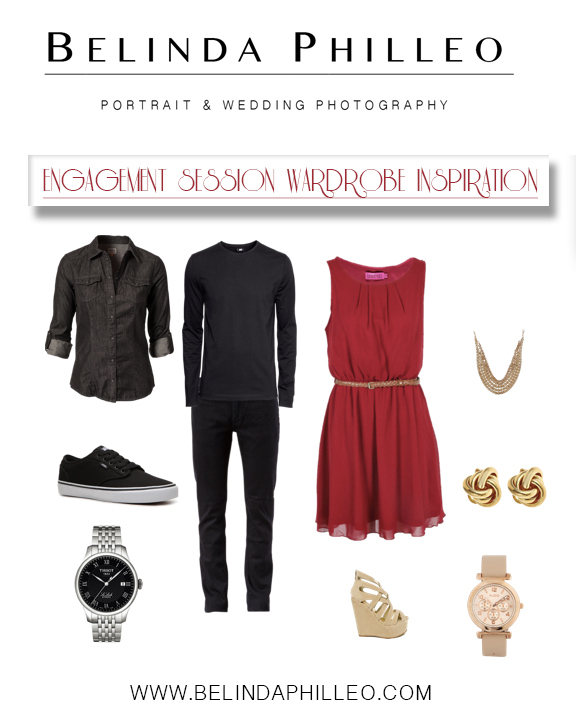 For today, I’m starting with engagement sessions. This particular combo is both simple enough to keep the focus on the couple, but the color scheme will add a layer of drama without distracting the viewer from the main subject. Solid colors are always best when you’re having your photos taken. Patterns will draw the viewer’s eyes away from the face and can take away the impact of a portrait. For women, you want to make sure you are wearing something that flatters your shape. While clothes that are too tight might show off some unflattering parts of your body, clothes that are too loose can make you appear heavier than you actually are. Today’s dress has a belt around it that helps define the waist, which can help show off curves in a flattering way. I would love to hear what you thought of this very first edition of What to Wear! Did it help? Did you find a way to improve upon it? Share your thoughts below!